‘On a recent morning inside a nondescript laboratory building in the middle of Central Park, Tina M. Nelson was watching for signs of trouble. Wearing a cobalt-blue lab coat, Ms. Nelson, who bears the unwieldy title of soil, water and ecology laboratory coordinator for Central Park, ground up a soil sample from the Conservatory Garden with a large mortar and pestle. She then used a 3.5-cubic-centimeter soil scoop to gently add a bit of the earth to a crucible before placing it into a kiln to burn off the organic matter. “We haven’t looked at this area for a little while,” she said. 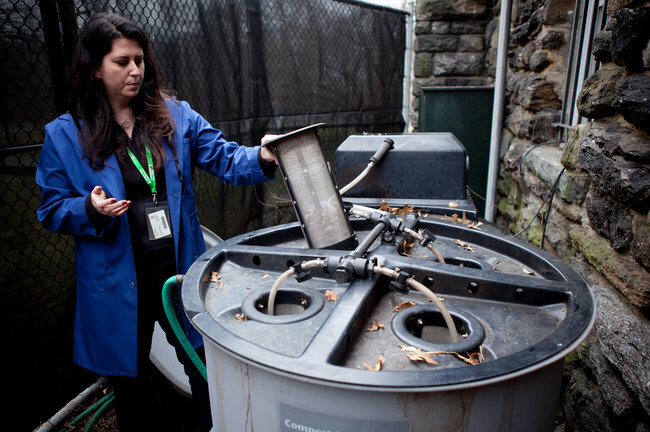 Ms. Nelson is, quite simply, the diagnostician for every aspect of Central Park’s natural environment. She tests the soils to see if there is too much nitrogen here, too little potassium there, and also monitors the park’s bodies of water. Her intimate knowledge of the park’s 843 acres — whether there has been an outbreak of curly-leaf pondweed on the Harlem Meer, for instance, or a brown patch of grass at the Sheep Meadow — helps landscapers decide what steps to take to maintain their assigned zones . . . .
Much the way a sculptor uses a block of marble, the landscape architects Frederick Law Olmsted and Calvert Vaux carved groves and meadows, ponds and waterfalls, onto the surface that is Central Park. The conservancy, similarly, employs a range of tools to make those landscapes resplendent. While fertilizers are applied judiciously, the park’s landscapers in recent years have turned to more natural remedies. The liquid is then diluted with 400 gallons of water and sprayed on the seven major lawns twice a year, as well as on flower gardens and newly planted trees. On a recent day, wisps of steam rose from the top of the compost pile. Ms. Nelson is responsible for ensuring its health, too, and frequently sticks a thermometer, attached to a long pole, into its belly. “When it reaches 120 to 130 degrees, we need to turn it over,” she said. Ms. Nelson, who holds a degree in wildlife and fisheries conservation from Louisiana State University, has run the park’s soil lab for five years. Hydrating herself with an occasional sip of water from a beaker, she moves soil samples through a process called segmented flow analysis, in which the respective amounts of nitrogen, potassium and phosphorous are determined. She also keeps tabs on the park’s wildlife, trying, when it is possible, to fight nature with nature. In the summer, to combat aphid infestations along the park’s shorelines, she releases ladybugs purchased in gallon containers. The ladybugs eat the aphids, sap-sucking insects that are the bane of gardeners. More challenging is the algae that can appear on the park’s half-dozen lakes and ponds, all of which are man-made. While the park’s landscapers avoid spreading fertilizer near shorelines, the water runoff from streets and sidewalks can overload lakes with nitrogen and phosphorous during heavy rains, leading to blooms of algae. Two to three times a week, from March to September, Ms. Nelson tests the water in places like Turtle Pond, the Lake and Harlem Meer, measuring temperature, pH and dissolved oxygen levels. The Harlem Meer, in particular, has struggled with filamentous algae, which resembles a green wooly mat and competes with plants for nutrients. Ms. Nelson periodically dispatches an algae harvester on the Meer. A small barge with pontoons, the harvester uses a conveyor belt to scoop up the algae. Once the algae was tamed, however, curly-leaf pondweed, an invasive perennial, moved in. “Nature abhors a vacuum,” Ms. Nelson said. At Turtle Pond, she has gone out in waders to rake filamentous algae by hand. The Lake, at 72nd Street, has its own troubles, with an excess of blue-green algae. Still, Ms. Nelson is against treating the park’s bodies of water with chemicals. “Absolutely not,” she said. For now, she added, aerating lakes and ponds with sprinklers is the safest way to restore oxygen and increase the population of largemouth bass, yellow perch, catfish and sunfish. Ms. Nelson’s detailed understanding of the park’s ecology can sometimes be burdensome. On weekends she likes to visit the park with friends: a favorite picnic spot is the Great Hill, near 106th Street on the west side. But downshifting to a more leisurely mode is not easy. “If I see phragmites in a water body, or people feeding bread to ducks and geese, I think, ‘Oh, I should do something about that on Monday,’ ” she said. When ducks rely on humans for food, especially if it is non-nutritious bread, they can develop a disease called angel wing, she explained, and eventually lose their ability to fly. via In a Central Park Laboratory, Providing the Diagnosis for an 843-Acre Patient – NYTimes.com. This entry was posted in recycling, urban ecology and tagged central park, golden gate park, urban ecology. Bookmark the permalink.